Abune Paulos, Patriarch of the Ethiopian Orthodox Tewahedo Church has died at the age of 77 at Balcha hospital. 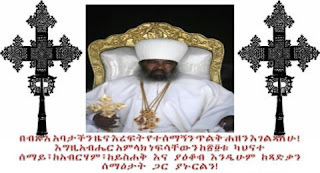 Abune Paulos was born in Adwa in November 03,1935. His birth name was Gebre Medhin Wolde Yohannes. Office of the Patriarch gave an official statement up on the death of the patriarch.